Having spent her entire life neglected and abused in a puppy farm Violet had many problems when she arrived at DBARC. Probably the least significant was a heart murmur, which was scanned and checked and not considered enough of a worry to delay dealing with her multiple issues. She was spayed and had two tumours removed from her leg and back. The nature of these weren’t known for a while but eventually everything came back good, the anaemia she had cleared and eventually she was fit enough to undergo eye surgery to restore her vision. In November, Violet underwent surgery on both eyes. Unfortunately, due to complications it was only possible to save the sight in one eye and the other had to be removed for Violet’s best future. This was extremely disappointing as we had all hoped for the perfect outcome for this special girl who had already endured so much. However, Violet had been blind for an unknown period of time and had learnt to adapt to her surroundings. She's a resilient, brave little schnauzer and went on to recover well in the safe, secure home of foster mum, DBARC Manager, Janet North. 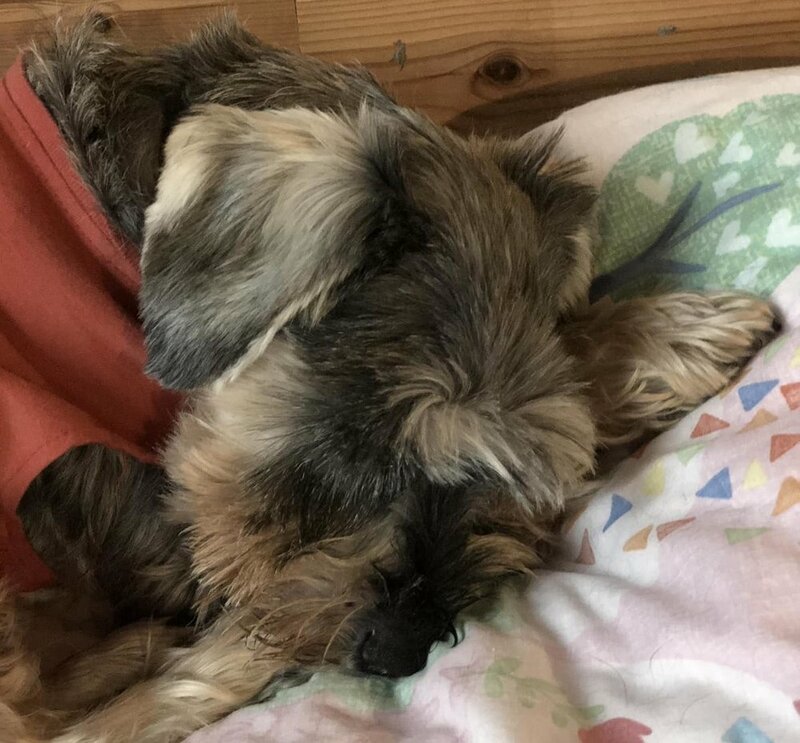 What Schnauzerfest support and fundraising enables, is for the very best chance to be offered to dogs like Violet, those with complex needs and for whom the outcome of specialist procedures is far from certain. It eases the very real financial burden for a small rescue trying to do their utmost to provide the best future for animals who have been badly exploited in their lives. Violet spent a few more weeks recovering from her surgery and today the very good news is that she is heading off to live with her wonderful new family. A family which includes our lovely girl Gertie, who only a few weeks before Violet had also been gifted sight and spent time learning all about love and kindness with the DBARC team. What a great result for both dogs, and the icing on the cake is that their home is local to DBARC so they will get to visit their old friends often. Perfect! After spending her first Christmas in a loving home, Violet continues to settle into being a loved dog and not the commodity she was for years. For a dog whose only worth was the puppies she could produce, Violet has certainly landed on all four paws with her new family. As they live locally to the Diana Brimblecombe Animal Rescue Centre, they do get back to say hello to Janet and her team from time to time. Without the dedication and commitment to doing the very best for every animal in the care of DBARC, the lives of dogs like Gertie and Violet could be very different indeed. This is why Schnauzerfest has been supporting their work and helping them to expand what they do, since 2014.